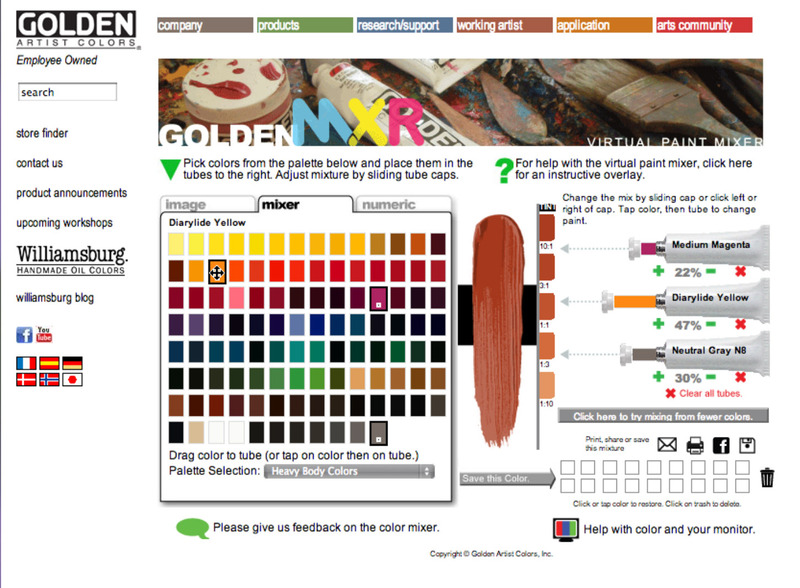 I recently discovered the Virtual Paint Mixer by Golden Artist Colors, which I think is another perfect example where art and technology come together for a functional purpose. Select from Golden’s paint collections and test out mixing proportions of the paint colors for an estimate of what the custom color would look like in person. The paint mixer only uses Golden acrylic colors, but I bet you can still get a good idea by comparing similar colors in your own palette. It’s a very thorough tool, even allowing you to save your custom colors or print them out. Personally, I’m a bit more intuitive when it comes to mixing color so I may not use this as a resource for myself – at least no time soon. However, for those that are more technical or cerebral about mixing paint colors then this may just be a useful tool for you. It could certainly help minimize mistakes or muddiness in color just by practicing the color proportions on-screen. Though the caveat here would be to keep in mind that colors on-screen won’t be a true depiction of what you will see in person. The best you can hope for is a general idea. You’ll still have to rely on your own abilities with seeing and mixing color at a certain point, so I would suggest allowing the Virtual Paint Mixer to be a guideline at best and not a hard/fast rule. Play with it and let me know what you think! You can find it here.